Nash With Period Vintage Wedding Gown! As a semi-professional photographer I had the opportunity to do a photo shoot for the vintage wedding gown division of Making Memories - www.makingmemories.org. As a non-profit that sells donated wedding dresses to benefit breast cancer victims I felt compelled to do this work for them pro-bono for the Making Memories Foundation. When I learned that they had several hundred donated vintage wedding gowns that they were starting to market I know what approach to take for the photos to be used in their sales brochures. 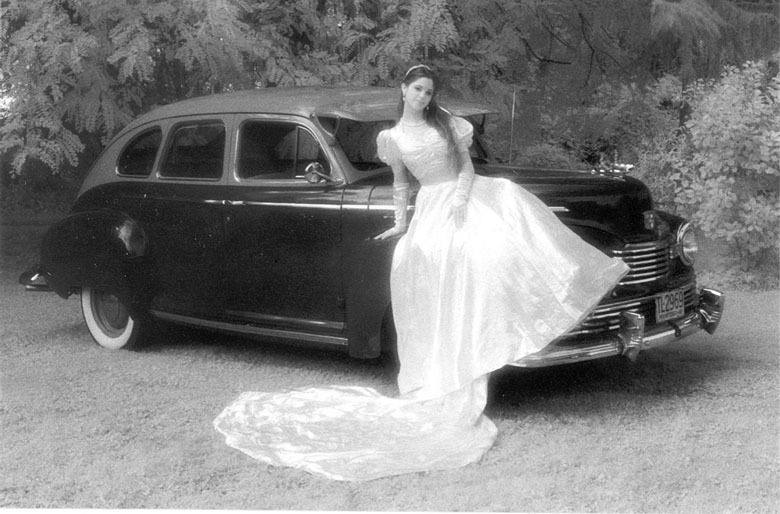 That approach was to match the era of the dress with a Nash of the same time period. The attached photo is of my 1946 model 4640 and the lovely model is wearing a gorgeous shimmering gown from the mid 1940's. I used a special Kodak infrared film for this photo to give it a unique almost timeless look.